The biggest names in Wall Street banking are back to business as usual. And if they're wrong in declaring the financial crisis over, the big losers will be President Obama and the American taxpayer. 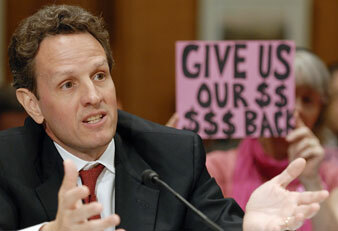 A protester holds a sign behind Geithner as he addresses a hearing of the Congressional Oversight Panel of the TARP. If Jamie Dimon of JPMorgan Chase and Lloyd Blankfein of Goldman Sachs turn out to be correct about the financial crisis, their institutions emerge unscathed and restored to their old dominance over the US economy. Minus a few old rivals who went bust. If the bankers are wrong, Barack Obama will be the big loser–compelled to rescue them again with still more public money. The big dogs of banking know this, so does the president. That’s why he didn’t throw his hat in the air when ten of the largest banks were allowed to pay back the emergency aid they received from the feds, some $68 billion. The financiers could thus declare themselves free and clear of the heavy hand of government meddling. Another triumph of free-market capitalism. A brilliant success for Goldman Sachs socialism. Barack Obama is holding the bag for what happens next. There is rough justice in his predicament. The essential bet Obama made as president was to insist on a “voluntary” approach to rescuing the financial system, picking up the main policies launched by his predecessor. An odd-lot chorus of left and right critics (myself included) urged Obama to step up and employ the full force of government’s emergency powers to take charge of the troubled system and direct their behavior. Heal the wounded banks or liquidate them, use government financing to insure the lending and investing needed to finance economic recovery. Don’t leave it to the bank executives who will naturally take care of themselves first, maybe the country later. Obama rejected that option. He was most reluctant to nationalize banks or to assert full control of those zombies that government has had to keep on life support. His political logic was obvious–maintain the appearance of temporary interventions to assist private enterprise and avoid any accusations of left-wing activism. The right called him a socialist anyway. What are the odds Obama will win his bet? Not so hot right now, despite frequent pep talks from his economic advisers. If you think back to where this crisis began last year and what the authorities described then as their emergency response, big pieces are still missing in action. Bush’s treasury secretary, Hank Paulson, stampeded the Democratic Congress into providing $750 billion to soak up the rotten assets burdening the balance sheets of the largest banks. That plan was not pursued. The rotten assets are still largely there. Obama’s treasury secretary, Timothy Geithner, came up with an alternative approach–a complicated Monopoly game in which government would underwrite private investors to buy up the bad financial paper. That didn’t happen either. The bankers let it be known they would not sell the stuff–not at discounted prices, not if it meant admitting the depths of their true losses. Meanwhile, the government has also ducked the explosive question of derivatives–the casino-like “credit default swaps” that were very, very profitable for banks like JP Morgan Chase but became the time bomb threatening to blow up the entire system. The time bomb is still ticking. The bankers don’t want give up that lucrative business. The Obama officials have not yet found the nerve to go against the bankers’ desires. Finally, there is the real economy where most Americans dwell. Obama’s team is counting on a recovery in the second half of this year and his advisors keep predicting it with increasing confidence. The president is betting on that too. If his optimism is not confirmed by events, his problems multiply. The stock-market restoration celebrated by the bankers will begin to look like another financial bubble, driven by false hopes. Banking problems will worsen and they will he back for still more bailouts. And President Obama will have to take a second look at his happy assumptions. He might start by replacing some of the cheerleaders.